Special Services: Small shop full of Inspiration! 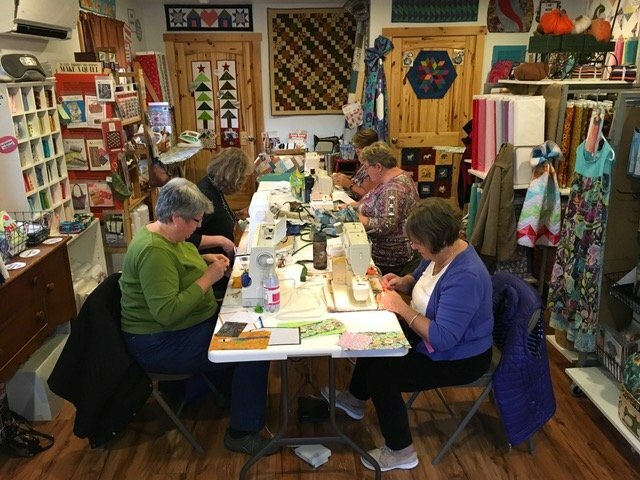 Offer classes and vend at local quilt shows and guild meetings in Maine and New Hampshire. Located in the center of small town historic Cornish in Western Maine, 10 miles from the New Hampshire border. In business 5 years in August of this year! 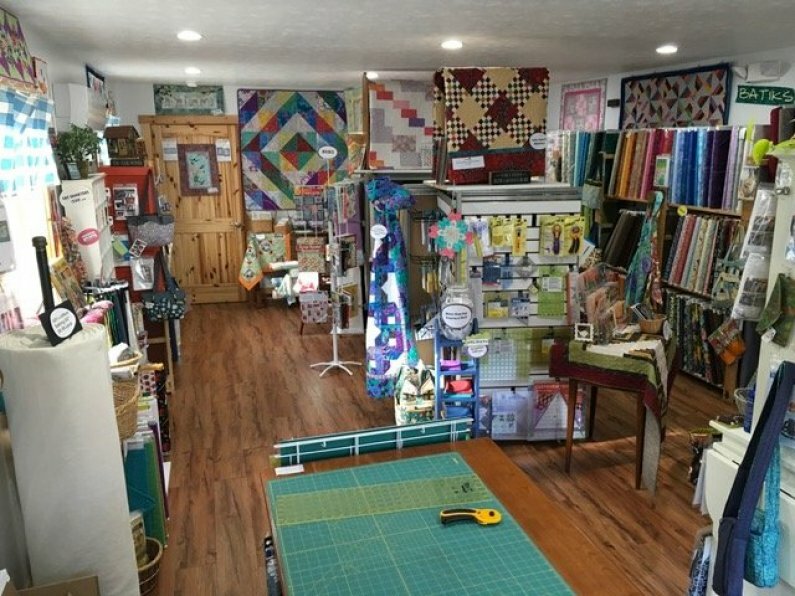 How is your store different from other quilting stores near you? The first thing you notice is how bright and colorful the shop is. I am grateful to have such good natural light! Visitors and customers always comment that I have such a wonderful variety of Fabrics in this small shop! I use vintage singer sewing machines in the shop including a 1910 Red Eye Singer treadle, so there is a unique mix of old and new here. 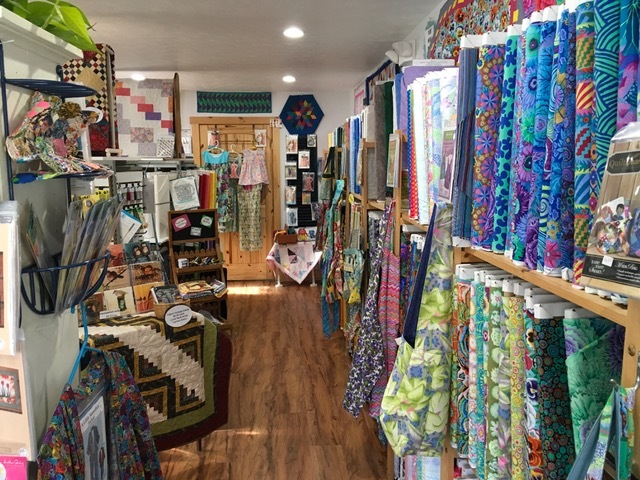 It’s important to me that when people walk through the door and feel welcome and when they leave they had a good experience and they are inspired (whether they are quilters or not). Music is very important in my life, and there is always music playing in my shop – mostly Vivaldi! What are some of the ways you display your kits and their samples? I make as many samples as I can! I display them together with the kits and patterns with good signage. I use every inch of my shop while leaving it open enough to be comfortable to look around and shop! I change displays all the time (my regulars are use to that now). How do you deal with weather challenges? Do you do more classes in other months and less in Winter? Winter weather in Maine is a challenge! I close the shop if they close the schools in our area due to snowstorms. I actually love snow days at home and post on Facebook what I’m working on by the wood stove! I am open all through the winter because we sew and quilt more in the winter months here. I actually hold more classes in the winter as I have more time. Spring arrives and we all go outside to garden! Summer and Fall bring tourists and quilt shows! Which season is your favorite in the store? I love each season in Maine and in my shop! I decorate for each season. If I have to choose a favorite it is Fall. It is so beautiful here in the fall. We have a local Apple Festival right across the street and I am part of a Leaf Peepers Shop Hop. Do you work in the store everyday? Yes! I love being in my store! I have quilting friends I call on to help me during a Shop Hop or anytime I need help. I recently changed my hours to 5 days a week instead of 6 days, except the month of April. 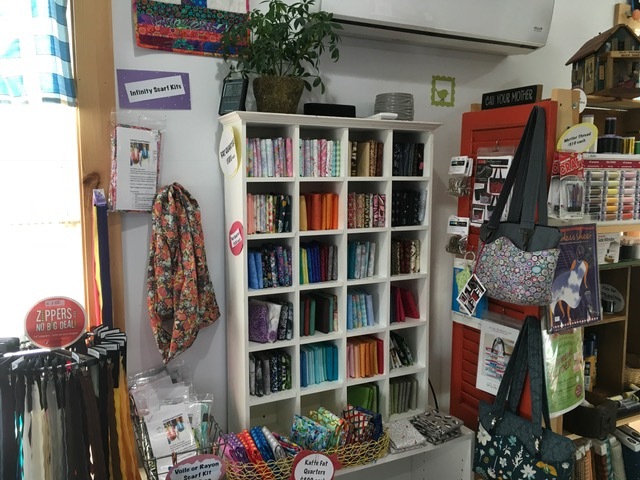 Maine Shop Hop Month means I am open everyday! I have no space for an office so I do some work at my counter at the shop and some at home. How many stores are in your shop hop? How far ahead do you plan and prepare for it? What are the pros and cons of participating in a shop Hop? 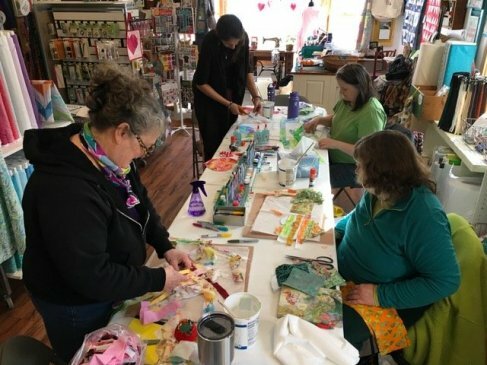 The State of Maine Quilt Shop Hop is the entire month of April. The committee of shop owners meet all year to plan it. Participating shops sign up in October. Fabric must be ordered by Dec and a challenge quilt made by March. Between 30 and 40 shops participate each year. Our Leaf Peepers Shop Hop is Columbus Day weekend -4 days and 6 shops in Southern Maine. We six shop owners meet throughout the year to plan. Pros and Cons? Shop Hops bring people to my shop who would never otherwise come here! It is worth every bit of money, time and effort to prepare for it and participate. I love meeting quilters from all over New England. For me, it has put me in touch with other shop owners and while you might think that would create competitive feelings, it has created a support system, especially the smaller Shop Hop! The only con I can think of is how exhausted I feel at the end of April after being open everyday! 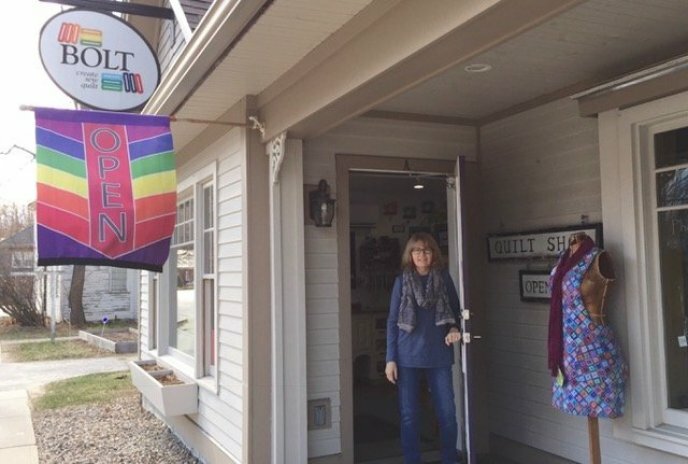 If you had to do it again would you open a quilt store? Absolutely! It’s a great feeling to know I am doing exactly what I am suppose to be doing! Advice for a shop starting out? Find resources to help you with what you don’t know. Write a business plan but know it may change after you get started. Just refer to it and revise it. Ask fabric reps lots of questions. 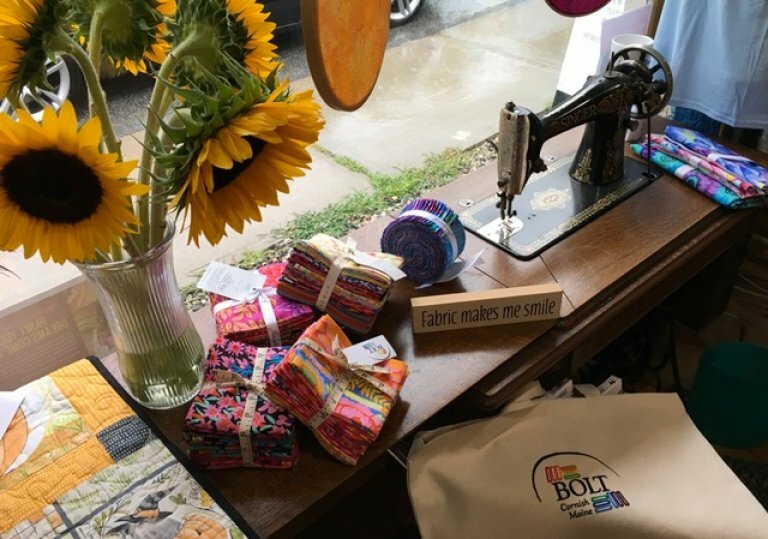 Listen to your customers and quilting friends. Subscribe to trade magazines like American Quilt Retailer!